VE150 - Aten CAT5 VGA Extender up to 500 ft.
Aten CAT5 VGA Extender up to 500 ft. The ATEN VE150 is a CAT5 VGA extender which extends up to 500 feet. 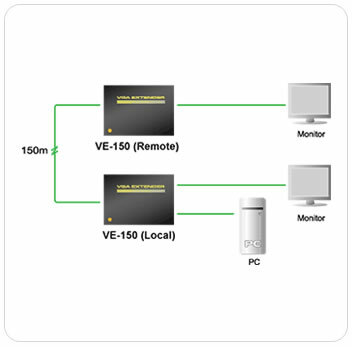 The VE150 video extender comprises a local transmitting unit and a remote receiving unit which are connected by standard Cat 5e cables. The distance of both units can be extended up to 150m. It is ideal for factories and construction sites, or any location where the display may need to expose in a risky setting, but you want the system to be kept in a safe location. Transmission distance of up to 150m / 500ft.